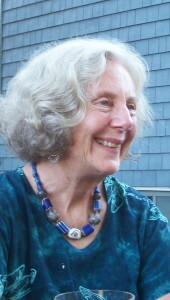 Several posts in this series have discussed the gradual loss of rights and dignity by free people of color, as each new frontier became “civilized.” This fascinating link, shared by Rebecca Krause-Hardie, allows us to see something of what was driving that process. 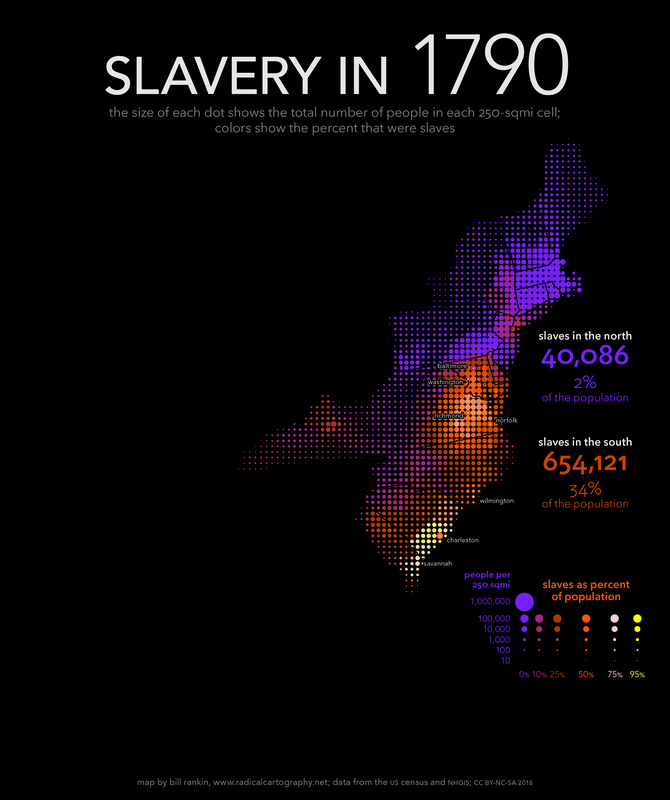 If you hover over the link for each decade in succession, and watch the changes in the colors of the dots that indicate the proportion of people in any given area who were slaves, you can watch the spread of the plantation economy from Virginia to the south and west. A dull orange-brown color indicates a proportion of slaves between 25% and 50%; a bright orange 50% to 75%; and white more than 75%. 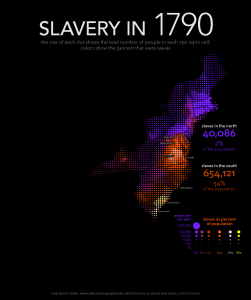 Taken together with the history we have been exploring, the series of maps suggests that in any given state, the sharp restriction of the rights of free people of color occurred at around the time that the proportion of slaves in the most populated areas of the state exceeded 25%. (The loss of rights in Virginia occurred in the early 18th century, before this series of maps begins.) At that point the plantation economy had become so dominant, and slavery so essential to its survival, that nothing could be allowed to threaten it. Those who benefited from the system had to justify it by a belief in the fundamental inferiority and stupidity of the people they owned. Any ambiguity in caste lines – such as that created by the existence of successful free people of color – was a threat to a world view based on the need for permanent subjugation, and thus a threat to the entire system. Along with the spread of the plantation system came an increase in the monopolization of land by the big planters, an increase in the concentration of wealth, and an increase in social stratification. From my own point of view, it is interesting to track the westward migrations of my ancestors – always just ahead of, or on the leading edge of, a fully slave-based society. Were they escaping from that increasing stratification, or trying to beat the competition by bringing it with them? Glad you enjoyed it! I found it fascinating – couldn’t stop staring at it and running the decades back & forth.